One of the most satisfying activities that the Friends’ group supports are regular volunteering sessions, both in Parsonage Gardens and in Fletcher Moss Park. In Parsonage Gardens there is a regular Tuesday morning Volunteers’ session, where people come to help with a range of jobs that keep the gardens looking their best all year round: planting, pruning, propagating, tidying, weeding, general maintenance and working in the Alpine House (our pride and joy). As a result of the care and hard work of the Friends, the Gardens have won a number of awards in recent years, and it is always rewarding to have the positive comments of visitors. 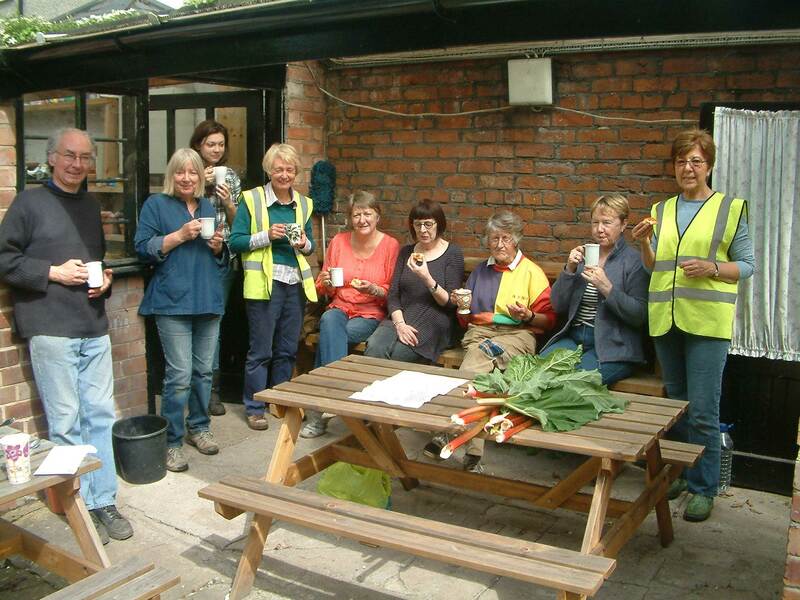 The volunteers meet every Tuesday from around 9.00am at the Alpine House. All inputs are welcome, whether it is for a 2/3 hour session or just for a short time – whatever suits you. Refreshments and a good chat are always part of the morning and the atmosphere is warm and friendly. Equally important are the volunteering activities in Fletcher Moss Park. These take place every Wednesday afternoon, starting at 1.15pm and meeting at the Visitor Centre in The Croft, off Millgate Lane. Once again there is a range of activities on offer to suit the needs of the park and the interests and abilities of the volunteers; and there is always a cup of tea (or coffee) and biscuits to keep the helpers going! Please come along if you think you can make a contribution, learn from others, or pass on your knowledge; it is an excellent way of keeping fit! All our volunteering activities are self-directed. You are never 'told' to do anything; you do what you are interested in and comfortable with. If you want to learn new skills there will be someone there to help you. Please make sure you come appropriately dressed for gardening work - shoes, clothes, gloves (essential), sun-block (if needed), and insect repellent (if needed). A first-aid kit is provided. If you would like to help please come along any Tuesday morning or Wednesday afternoon; if you want to know more about the volunteering activities please e-mail us using the details in the 'Welcome' page. Every Monday throughout the year (with the exception of Bank Holidays) there is a Health Walk around Fletcher Moss Park, lasting for around an-hour-and-a-half. The walks are led by a Park Warden or an experienced Health Walk Leader. There are also additional longer walks every fortnight starting at different points along the Mersey Valley. The walks are popular and there is a very good social atmosphere among the walkers. Walks are always rounded off by refreshments (tea/coffee and biscuits) and a good chat. The walks are supported by the Manchester City Council and the Health Promotion Group (NHS), as walking is one of the easiest and friendliest ways to keep fit. If you want to play tennis on the courts which have now been brought back into use, please do so. We are very encouraged to see people once again making use of the facilities (see item on Tennis in the 'News' section). There are regular sessions, with coaching if you want, for the over-50s on Thursdays, and for anyone on Saturdays (both from 2.00-4.00pm). We want to see as many people playing as possible. If you would like to know more about the tennis via Twitter go to @FMCTennis. There is an extensive network of paths around the area of Fletcher Moss - around the Gardens, through Stenner Woods, round Millgate Fields, and along the river Mersey. Much of the area is a Local Nature reserve (LNR) and there is a variety of wildlife to see and vistas to enjoy. At first finding your way around can be a little confusing, and a map of the area might help. (1) Fletcher Moss Park. There is a small car park on Millgate Lane which has two bays for disabled users. On entering the park through the gate next to this car park there are surfaced paths which are suitable for wheelchair (and pushchair) use, though there are some slight inclines. A steeper incline leads to the café and paths up to the Wilmsolw Road entrance. The Wilmslow Road entrance is also accessible if you park in the car park of The Didsbury pub, for which there is a charge of £2 (redeemable if you eat or drink in the pub). Unfortunately our Rockery Gardens are not suitable for wheelchairs as there are steps and steep slopes. There are (brick) outside disabled toilets in between the house (The Croft) and the Millgate Lane Car Park. (2) Parsonage Gardens is mostly suitable for wheelchairs, from either the Eagle Gate entrance near the Olde Cocke pub (park in The Didsbury pub car park) or from the Stenner Lane entrance (park on Stenner Lane). There are good quality disabled toilets in the Old Parsonage. There is a Nature Trail through Stenner Woods, along Stenner Lane and around the Health Walk (which circles the large 'Hay Meadow' between the woods and fields). More information about the Nature Trail can be found in the Visitor Centre in The Croft (off Millgate Lane). For an update on what nature is to be seen and heard at the moment in Fletcher Moss go to the 'Wildlife' page. However nature is to be found everywhere in the area of the park. There are many species of birds, different in the summr and in the winter, there are many different plants, wildflowers and trees, bats fly along the river at dusk, and in the summer there are insects such as dragonflies and butterflies. We are always interested in finding out what people have seen, and trying our best to answer questions about the wildlife of the area. To report something you've seen, or to ask any questions you might have, please use the 'Contact' button at the left of the page and send us an e-mail.